A mesa is an area on a semiconductor wafer where the semiconductor has not been etched away. 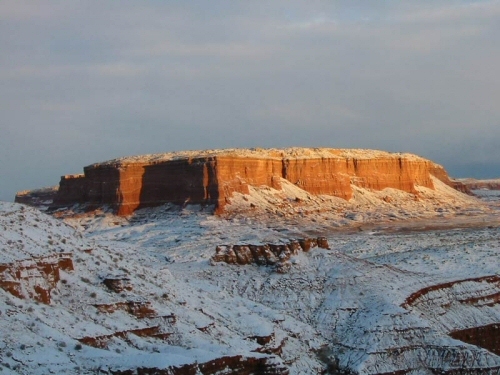 In nature a mesa is a flat-topped mountain; on a semiconductor a mesa also rises above the surrounding semi-insulating substrate, but the height is typically less than one micron. A smaller scale for sure! It is possible to create a resistor using ion-implant techniques that are purely planar to the substrate, these "implanted resistors" have the same properties as mesa resistors and so we'll lump them in to the same category. Contacts to mesa resistors are established using source-drain (SD) metal (also called Ohmic metal) which is alloyed at high temperature to provide a low resistance, non-Schottky contact. A passivation layer is always added to protect the resistor (SiO2 shown pretty in pink) and has to be opened up to allow contact between the thick metal used for transmission lines and the SD metal which should be avoided for T-lines because it is lossy. Looking at the cross section below, the total resistor value has three series components which we have denoted RC, RM and RC. The mesa itself (RM) has a value that is calculated from its sheet resistance and number of squares chosen by the designer (length/width). Typical values for sheet resistance are 100-500 ohms/square depending on what/who's process you are using, which is usually much higher than you can get with thin-film metal resistors. The RF sheet resistance is essentially the same as the DC resistance, because the thickness of mesa resistors is typically much smaller than a skin depth. The contact resistance "RC" shown in the cross section is usually given in Ohm-microns, and you calculate its value by dividing by the width of the contact, not the area. In this case the only dimension you have to consider is the width of the contact region, not the entire contact surface. What's up with that? When you think about it this makes a lot of sense. In such a horizontal structure, the DC current prefers to run within the path of lowest resistance, and in the RF case, the waveform actually penetrates the mesa and gets up into the metal as well. The current stays within the source-drain contact, until the very edge of the mesa resistor, where the SD contact stops. At that point the current has to move entirely into the mesa, and here's where the contact resistance must be considered. Typical values for contact resistance are are 100 to 300 ohm-micron, so a ten micron wide contact would have ten to thirty ohms contact resistance. If you ignore this, it might not be such a big deal, especially if you are designing an RF choke resistor of 1000 or more ohms. Don't ignore contact resistance in the case of a feedback resistor. Contact resistance is typically measured or calculated for direct current only, but it is valid enough if you happen to use a mesa resistor in an RF path; an example of this might be in a parallel feedback path on an amplifier stage. 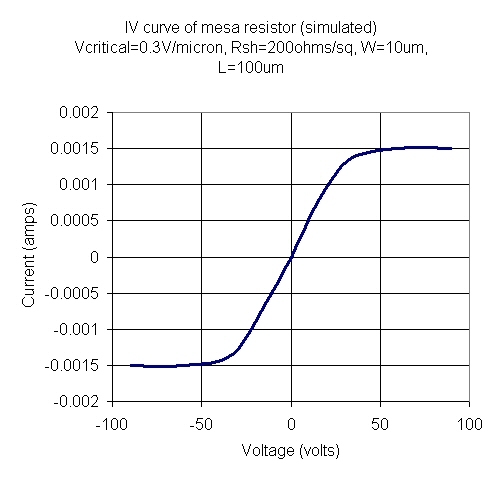 There's a problem with mesa resistors that you need to consider if you want to pass any appreciable amount to current through them. These are semiconductor resisters, and they have a nonlinear response. where Rsh is the sheet resistance for the process. The plot below illustrates this, although it is just a sketch of the problem we made using Excel, not real data. Here the sheet resistance is 200 ohms/square and Vcrit is 0.3 volts/micron. Therefore any resistor of 10 um width will saturate at 1.5 mA. The example resistor is 10 um wide by 100 um long, which should be good to about 30 volts. Why does this happen? To answer this question, we could make up something about "impact ionization of donor sites" or some such baloney. Engineers don't always care why something happens, they just need to avoid the pitfalls that may come up. If anyone has a real IV curve to illustrate this for us, we'd appreciate it! Mesa resistors have very poor temperature coefficients, at around -0.1%/degree C. Over a 100 degree C range, your resistor will vary 10%!